Hradcany is one of Prague's best neighborhoods to stay. Cobbled alleyways, hidden courtyards and Baroque palaces turn a stroll into a journey of discovery. The city's star attraction, Prague Castle, is only a few minutes away on foot. The Malá Strana district is dotted with a good number of enchanting hotels in quiet streets away from the tourist crowd. Baroque mansions have been repurposed and Renaissance houses were joined together. Some hotels have river view, others are triumphs of design. All are a feast for the eyes and pamper their guests. Prague is busy for most of the year and does not have a real low season. February and November are the quietest months. July and August are mid-season. High season is from April to June, September and October, and during the Christmas period. 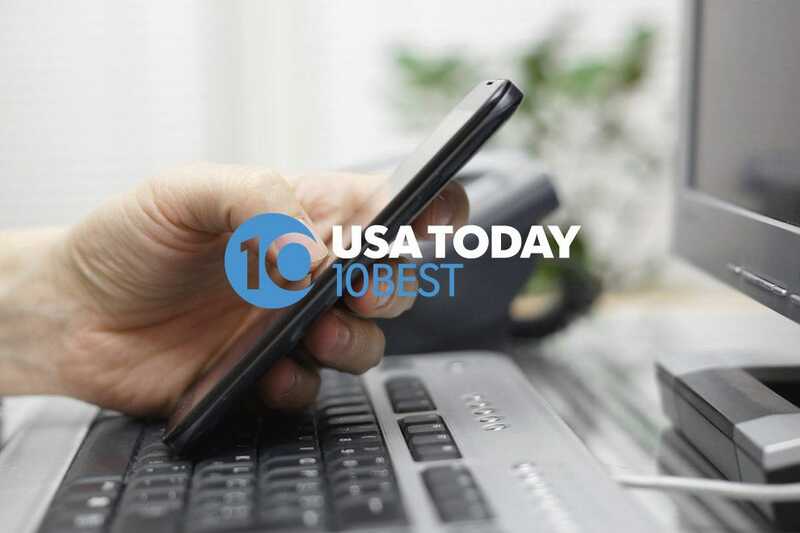 The lowest rates are from January to March. Prague is a compact city meaning that hotels situated in postal district 1 are always central and within walking distance of the most important sights. Five-star Hotel Jalta is simply heavenly. Apart from its classy atmosphere and first rate service, Jalta's biggest asset is its location on Wenceslas Square. The 94 stylish guest rooms with attention to detail are spread over five floors. Built in the 1950s, the hotel is an almost perfect example of Socialist Realism architecture. Government visitor from countries in the Communist Bloc were frequent visitors. The still existing thick-walled fall-out shelter is a legacy of the old days. 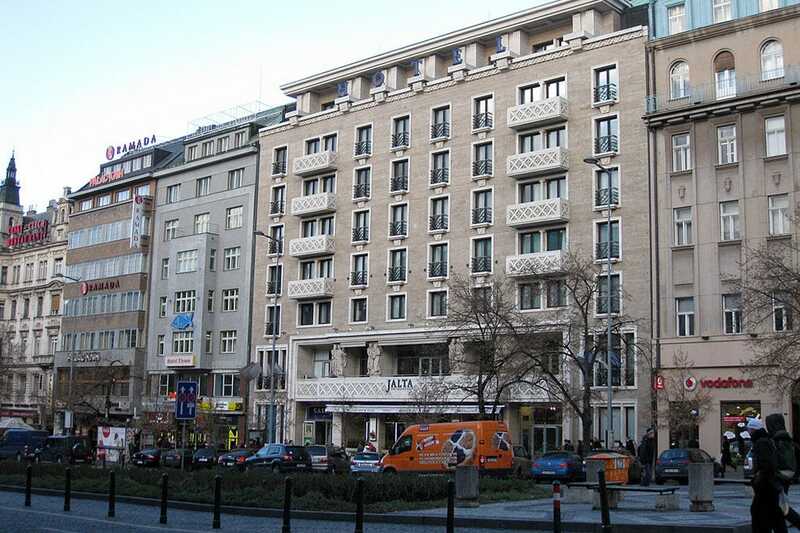 In those days, Hotel Jalta was one of the most modern pieces of architecture in Prague. Today, it is on the UNESCO World heritage list. Treat yourself to a stay in one of the hotel's two-room suites equipped with CD-player, satellite TV and high-speed internet access. Relax in restaurant COMO. Enjoy the best of Czech dishes or exquisite Mediterranean cuisine while you are listening to live music and watching the hustle and bustle of Wenceslas Square. Behind a sparkling Art Nouveau facade hides neat and modern Hotel Savoy. Huddle in front of the fireplace in the reading room or sip cocktails in the lobby bar. Savoy is the favorite haunt of celebrities such as Bruce Willis, David Bowie, Tina Turner and Princess Caroline of Monaco. 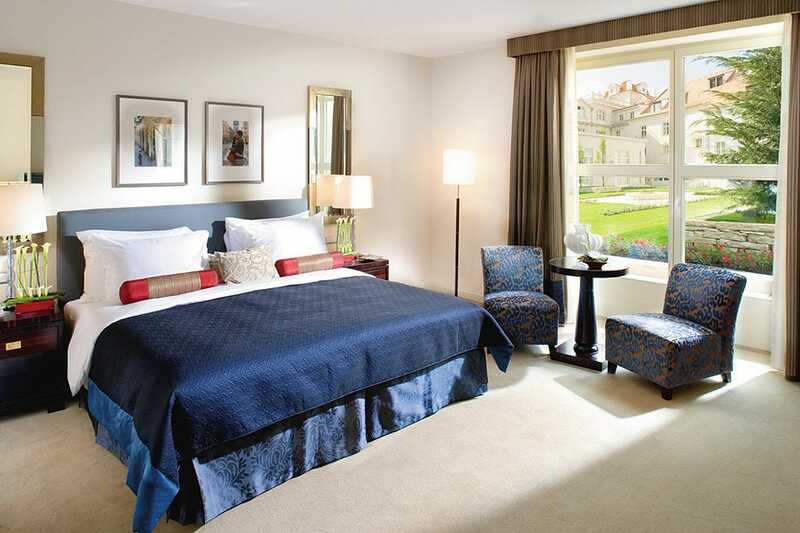 Located near Prague Castle, Hotel Savoy offers all benefits of a five-star hotel. The beautifully decorated guest rooms are spacious, the deluxe rooms are vast and suites feature private terraces with views of Hradcany district. The Savoy's elegant marble bathrooms are just one of the reasons to stay here. The wellness center with fitness room, Jacuzzi and exquisite cuisine in Restaurant Hradcany are another reason for a stay in Hotel Savoy. Hotel Crowne Plaza is an ode to Stalin. Built between 1952 and 1954, the hotel is a miniature version of Moscow State University. This shining example of Socialist Realist architecture has sixteen floors, a fallout shelter and is a listed building. The walls inside are decorated with murals depicting happy workers with bunches of hay tucked under their arm. Located in a residential area, Crowne Plaza is a fifteen-minute drive from the airport and only a few tram stops away from Charles Bridge, Old Town Square and Wenceslas Square. The high ceilinged rooms offer a spectacular panorama of Prague skyline. Sip cocktails in the bar while listening to live piano music. Treat your taste buds to Czech cuisine in the Harvest Restaurant or sample Moravian wine in the Racanská Wine Bar or have lunch with a view in the Club Lounge on the 14th and 15th floor. Hotel Josef is a modern piece of architecture where historical architecture blends with modernity. No frills, everything in the hotel looks rather basic, but is extremely elegant. 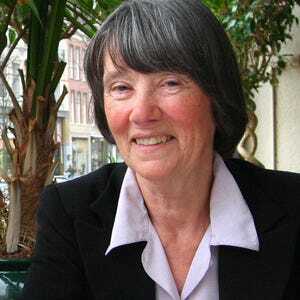 Czech architect Eva Jiricná known for melding light and glass into all her designs connected the two existing hotel buildings with a glass passage. Natural light streams in through wall to ceiling windows. She filled the hotel lobby with ivory white leather chairs and couches and added small glass tables with stainless steel legs. White stools complement the Plexiglas counter of the bar. The minimal continues in the guestrooms. 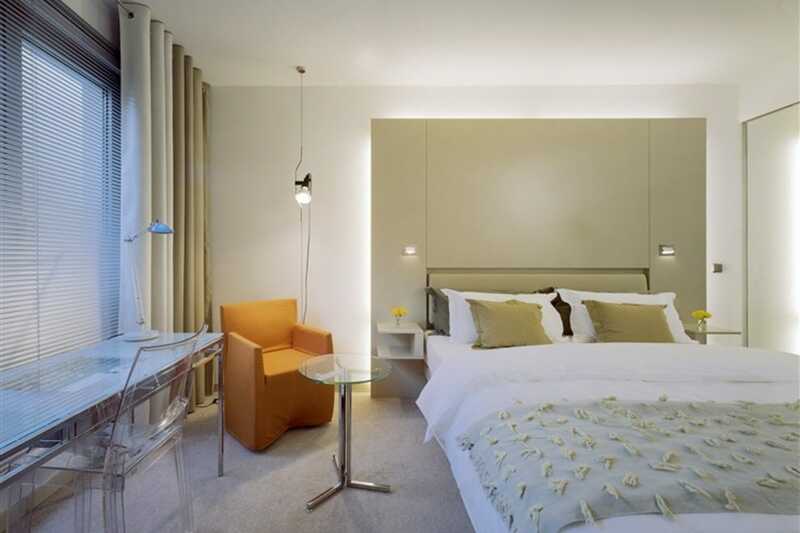 All 109 guest rooms are a symphony in natural color and impress with cool trendy design. Room service includes free WiFi, satellite TV, DVD and CD Player, mini-bar, bathrobe, hairdryer, rainfall showerhead and coffee and tea making facilities. Located in the historic center on the edge of the Jewish quarter, Hotel Josef is close to most tourist attractions and only a five-minute walk from Old Town Square. 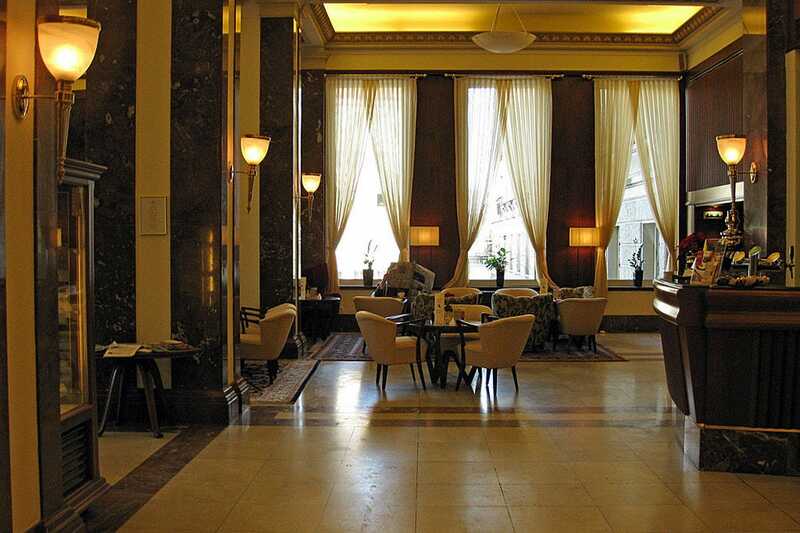 Hotel Praha used to be the favorite place in Prague for the Communist party elite to splash out and entertain guests such as Nicolae Ceaucescu, Erich Honecker and Leonid Brezhnev. Today the Praha is a popular haunt of Hollywood stars. Hidden in its private grounds, Hotel Praha is a luxurious complex. This terraced colossus is located in Dejvice, Prague's most prestigious neighborhood. Spacious guest rooms with all luxury expected from a five-star establishment will satisfy even the most demanding guests. One of the hotel's attractions is the fact that each of the 136 rooms has its own private terrace with sweeping city view. 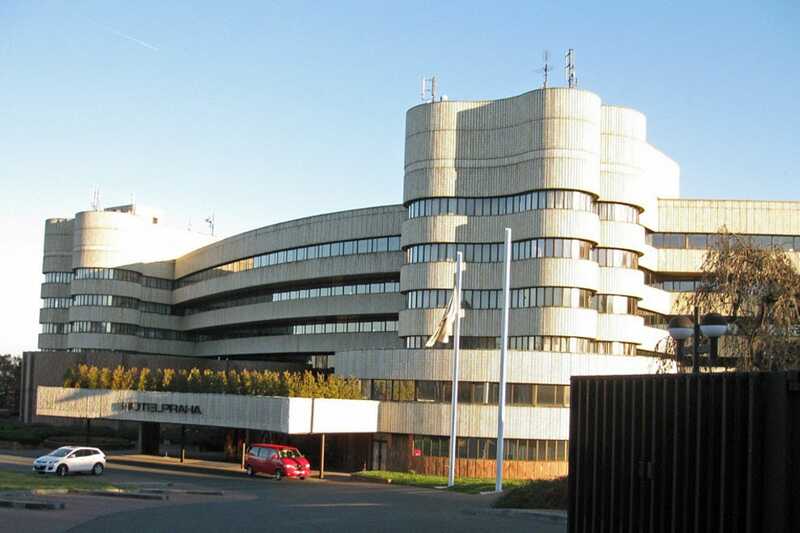 Hotel Praha opened in 1981 and is considered a prime example of Czech modern architecture. If you cannot afford to stay here, you are free to walk in and marvel at the sweeping curves, polished marble and crystal chandeliers in the public areas. 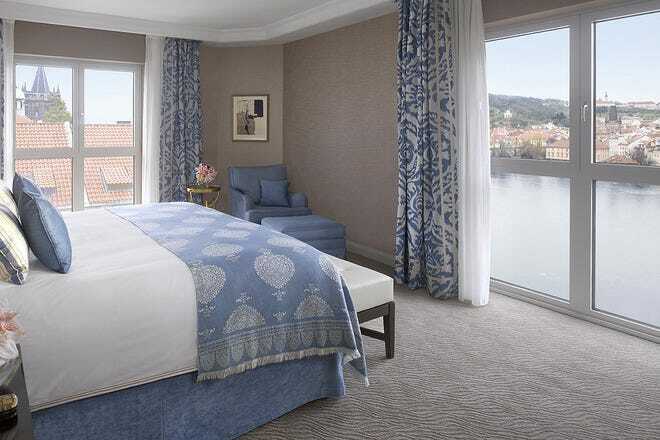 Situated on the banks of the Vltava River right next to Charles Bridge, Four Seasons is the creme-de-la-creme of hotels in Prague. This establishment combines old day charms with luxury of today. 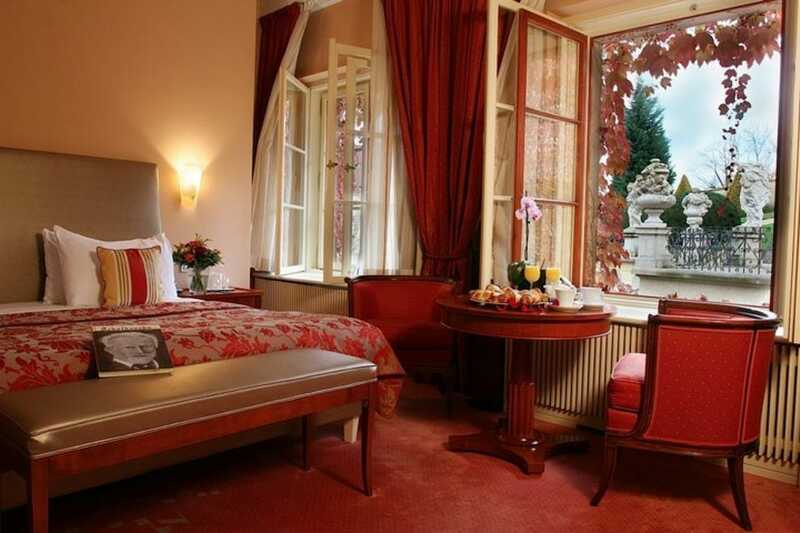 Three historic buildings from Baroque, Renaissance and Art Nouveau periods blend into a new truly five-star deluxe hotel. Tall ceilings, period furniture and crystal chandeliers provide style and atmosphere. The Presidential suite includes a separate living area with a piano and fireplace, dining room, pantry and private bar but may not be within everybody's budget. The more moderately priced guest rooms in the Art Nouveau wing are less opulent but still very comfortable. The cuisine in the Allegro restaurant is a symphony of Mediterranean dishes; fresh seafood, homemade pastas and artisan products. The Four Season Hotel's central position makes it easy to explore the Old Town on foot, climb up to Prague Castle or amble along Wenceslas Square. 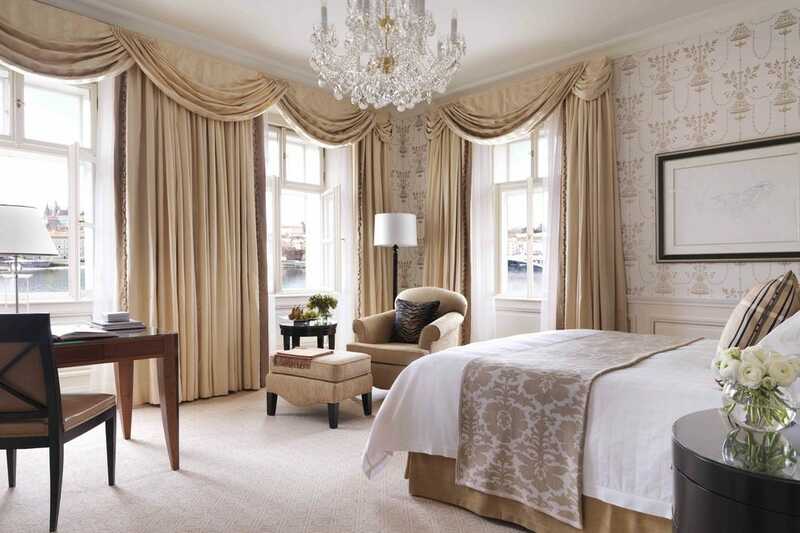 Set in a tastefully renovated 17th century monastery, Mandarin Oriental offers a variety of stylish guest rooms. Some have antique parquet floors, others have vaulted ceilings. Most romantic are the garden rooms in the cloister garden. All rooms are furnished differently. All have crisp bed linen and continental quilts. The hotel spa is incorporated in the Renaissance chapel with remains of a medieval church under a glass floor. The Mandarin oriental is situated right behind the Museum of Music and between Petrin Hill and Kampa Island. Prague Castle and Charles Bridge are only a short walk away. Music lovers will imagine themselves in the seventh heaven. Staying in Hotel Aria is a music filled experience. Each of the hotel's four floors represents a musical genre: jazz, opera, classical and contemporary. Guest rooms are dedicated to a specific musician or composer. Each room offers a selection of songs, aria, concerts and a biography of the artist on the flat screen computer. If this is not enough, guests can find more in the music lending library in the lobby. 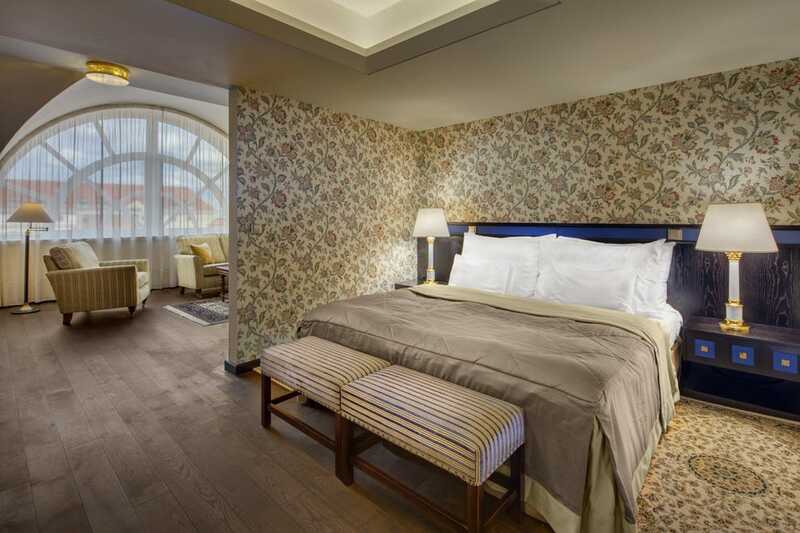 Whether you stay in the Gershwin, the Elvis Presley or the Smetana suite, all 52 rooms are unique. 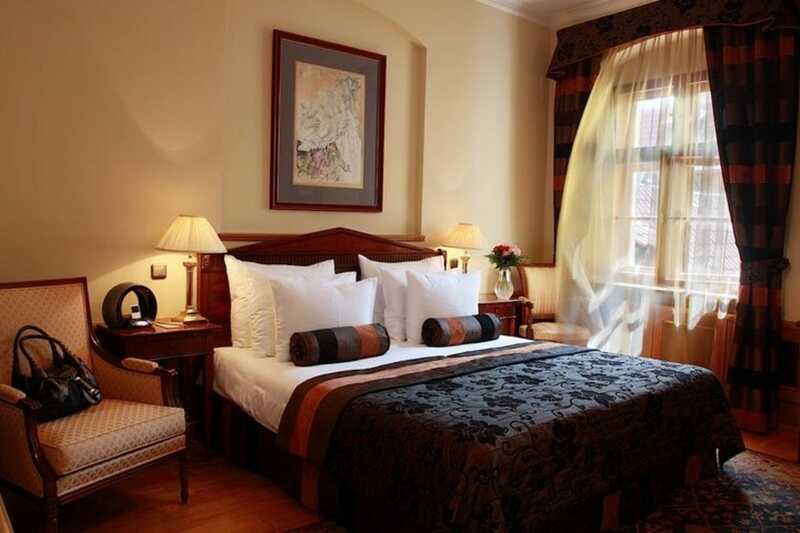 Hotel Aria is situated in Mala Strana amidst Baroque Palaces. The Vltava River, Charles Bridge and Old Town Square are only a few minutes' walk away. The Golden Well is one of the hidden secrets in Prague's Lesser Town or Mala Strana district. Tucked away in a cobbled back street of this delightful quarter, The Golden Well or Zlaté Studne is a luxurious boutique hotel. This historical building was once the property of the Emperor Rudolf II, member of the House of Habsburg. Located next to the terraced Prague Castle garden, The Golden Well offers incredible views of the red-tiled roofs of Mala Strana. The 20 spacious guest rooms feature wooden floors, original ceilings and a sitting area with period furniture. Amenities include WiFi internet zone, morning newspaper and evening turndown service with good-night extras. In fine weather, there is no better way than to start the day with a sumptuous breakfast on the summer terrace. The Golden Well is situated in the heart of Prague and within walking distance of most sights including Prague Castle, Charles Bridge, St. Nicholas Church and Old Town Square. Experience the Orient in the Buddha Bar hotel. Dark cherry wood, scarlet accents and wafts of incense add to its mystical charm. 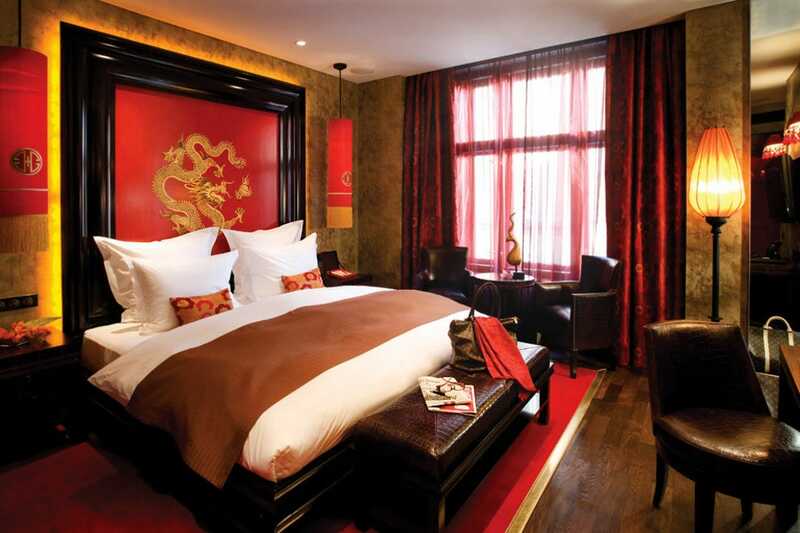 Crimson lacquer chests of drawers and a dragon mural suggest a stylish opium den. Buddha Bar chain started in Paris and spread out to other cities like Budapest, Dubai and New York. 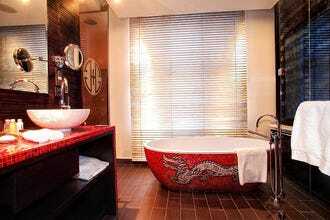 Located in a narrow cobblestone street, the Buddha Bar hotel occupies an Art Nouveau building in the historic center. Most of Prague's monuments are within walking distance. The Astronomical Clock and Old Town Square are only five minutes away on foot. The 36 guest rooms are a mix of oriental tradition and modern Asian interior design with a touch of French colonialism. Huge beds with mountains of pillow flanked by Chinese style lamps. A golden dragon against a crimson background embellishes the wall. The rooms offer all latest technology from Nespresso coffee machines to flat screen televisions. A free standing bathtub decorated with a red and gold dragon, a huge rain shower and a remote control to flush the loo are only some of the stunning details.